Flick me? No, flick you! Update: comcast found this post and responded in the comments. Impressive social media team! 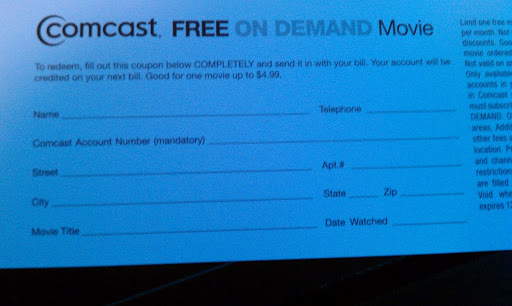 Comcast wanted me to have a free movie. You’d figure it would just be automatically credited to my account and i could pick one on VOD. Nope – flip over the coupon. You need to send it in w/ your account number AND the name of the movie you bought. Really? They can’t even use technology to correlate my account to the (or any) movie i rented? I can only imagine they state of their IT. Hi there. If you like, you can email our team once you've ordered your PPV movie. We can deduct the coupon and note your account for you. Please also include a link to this blog post. I apologize for any frustrations this caused. wow, thanks for the info. Appreciate you reaching out. 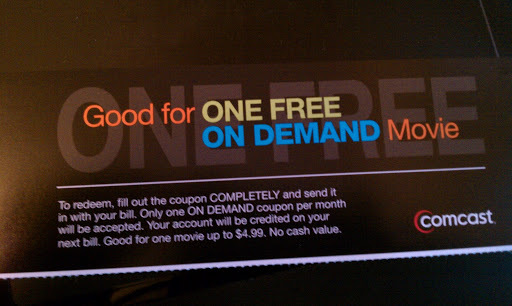 It's nice of them to give you the free movie, but why is that they charge all customers for on demand as part of your subscription, but then won't let TiVo or other DVR customers access that part of our subscriptions? It'd be one thing if they were withholding the PPV, but how is it fair to make people pay for something and then penalize them for wanting a better UI experience?